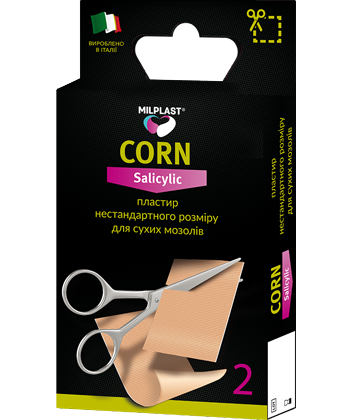 Due to the non-standard size, the plaster can be easily used for treating large calloused formations, as well as for small ones (for example, on the toes - cutting off a piece of patch of the required size). - Salicylic acid (35-40%), which decontaminates and reduces the problem area. For calluses only! For external use. Do not use in case of skin reddenings, damages, wounds and crevices. Do not apply plasters over two weeks without doctor’s advice. Do not leave plaster on the skin over 12 hours. Diabetic patients, patients with blood flow disturbances, pregnant and breast-feeding women, as well as children under 16 shall use plasters doctor’s advice only.